Happy Monday everyone! I’m so glad to be back to my kitchen this week after eating out all weekend. We went on a short trip out of town to celebrate my husband’s birthday, and while I looooovvvee the places we went, I’m kind of sick of restaurant food. I did take an idea from one of our meals out, and I’m going to recreate it at home later in the week. I’m also going to try out a new-to-me recipe for muffins that I saw on Money Saving Mom last week…they look so good! Do you ever get sick of eating out? Yes, we do get sick of eating out around here also. Especially if we end up in one of those fast food traps. I don’t think I’d ever get sick of having someone else clean up the mess though 😉 Your menu looks great. I think we’re going to have breakfast for dinner one day this week as well. I’m with you on that one Jean! I would love it if I never had to clean dishes again. We too get sick of eating out at times. I try to limit our eating out to once at week at the most usually for lunch after church. 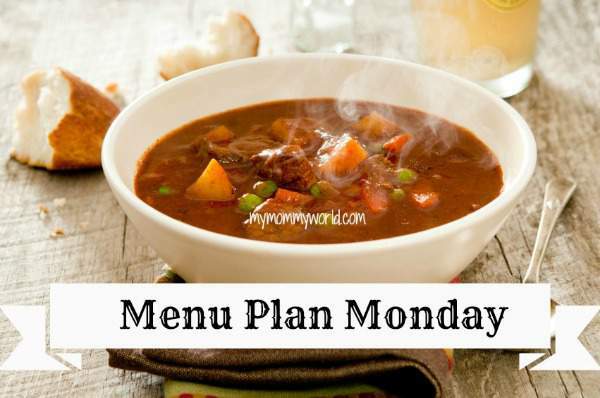 Your menu looks great this week. I’m sure it’s hard for your family to eat out quite often with the dairy allergy. Home cooked food tastes better anyways!